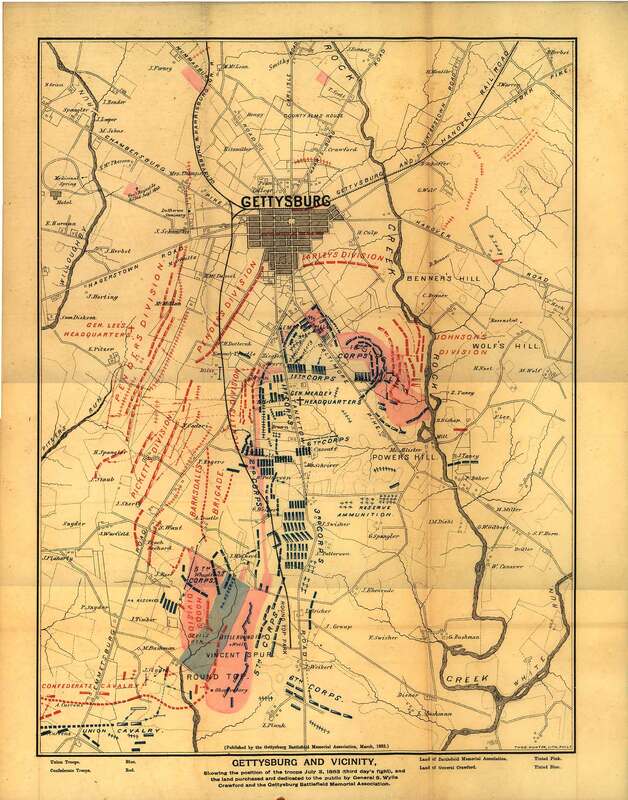 "That a committee of three be appointed to ascertain the cost of a map of the Battlefield of Gettysburg, with the lands owned by the Memorial Association indicated in color. Can your guide book map be used to accompany the last annual report of the Battlefield Association, the property owned by them to be assigned by stencilled colors? Red for Association and Blue for Crawford's land. If yes: what would be the cost of an edition of 1000-2500 or 5000 on good but thin map paper. Give me figures by return mail also time required as the maps are needed for the Legislatures now in session. For whatever reason, the idea of using the Bachelder tour book map was soon abandoned. General Wagner corresponds with parties in New York and Boston seeking a suitable publisher for the map. This map will show the town, all the roads and streams, hills and mountains, names of principal owners of land, our property in pink, Crawford's blue, position of rebel troops (3rd days fight) red, and Union troops blue, also names of Division and Corps Commanders on both sides. Shall I order 2500 or 5000? The latter strikes me as the proper number. General Wagner contracts with Thomas Hunter of Philadelphia Pa. to print the map, though vice-president McCreary, in a letter to Bachelder, frets at the delay in its completion. Yours just recd. It was a happy thought and I am very much pleased to see that you have done just what was needed, and what may enable us to pull through. The delay on our part is caused by Gen. Wagner's inability to get our map ready. You may know that at his suggestion the board agreed to make a map of the battlefield so as to show what we own of it. This to be used in connection with our efforts after appropriations. I am almost out of patience at the delay in getting it ready and fear it will throw us too late to accomplish much this winter. I now hope your action may save us in your state. Wagner is chairman of the sub-committee and you and I are the other members. I am in expectation daily of hearing that he is ready to move. The map is finally printed by Hunter in March of 1883 as indicated by the inscription along the bottom border of the map. 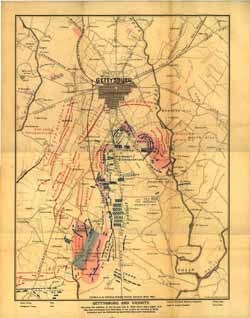 the Association reports that: "For the purpose of giving correct information to the Association and to the general public, we have published a neat Map of the battle-field, showing the positions of the armies on the third day of the battle, and showing the land owned by and under the care of the Association. A large number of these, in connection with a pamphlet containing the Acts of incorporation, and Reports upon the organization and work of the Association, have been circulated, and we think, with good effect." 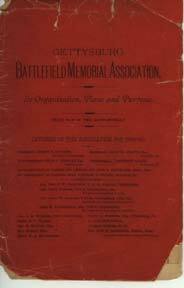 Resolved, That the officers be instructed to prepare and have printed a circular setting forth concisely the origin, aims and purposes of the Gettysburg Battlefield Memorial association with statement of what has already been accomplished and what work remains to be done. Resolved, That Gen. Wagner be authorized to have printed a new edition of the map of the field with such changes as have been made since the first edition was published." The paltry holdings on the first days field would be addressed shortly with the issuance of a second edition of the map in 1885. The Bachelder Papers, Vol 2. Morningside 1994, p. 917. Transcribed Minutes of the GBMA p. 97 and 101.